Some feel it as soon as the summer’s first barbecue ends. For others, that mix of emotions (including, for most parents, a bit of a guilty lift) start right about now—as the calendar flips to National Back to School Month! August is here, and Excel Dryer is ready for class. 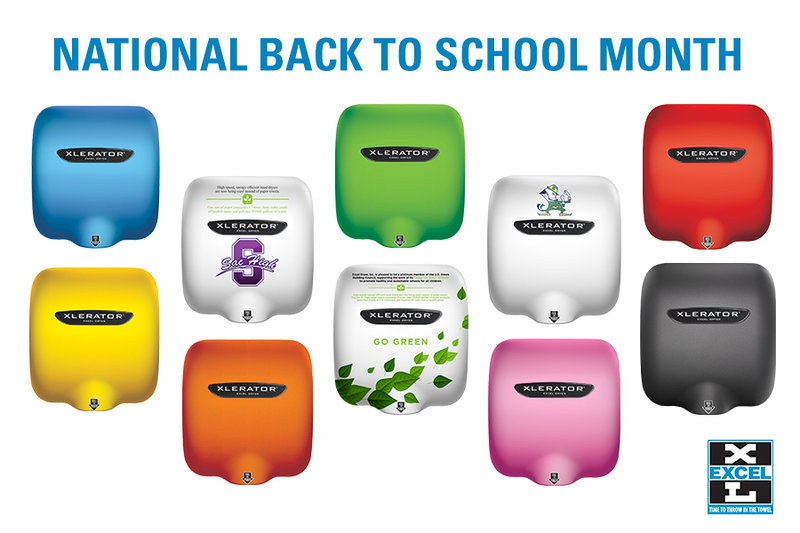 We’re quite the fans of education, and we’re pleased to say that the feeling’s mutual; schools are among the facilities that most benefit from our original, patented, high-speed, energy-efficient XLERATOR® Hand Dryer. In honor of this important relationship and exciting month, Excel Dryer would like to share a few of our favorite school subjects. There’s little we don’t do by the numbers. Hard data backs all of our product advantages, which we share in a customized cost-savings analysis for each facility we serve. The report for Sacramento Charter High School (known locally as Sac High) in Sacramento, California, estimated XLERATOR would reduce the school’s carbon footprint by 80.73 percent, for which the United States Environmental Protection Agency (EPA) estimates an equivalent annual savings of 104 trees, 18.48 cubic meters in landfill space, over 123,000 gallons of water, and emissions from over 116 gallons of gasoline. Throwing in the towel also could save Sac High almost $17,000 annually—a 97.96 percent savings versus paper towels—and eliminate 5,587 pounds of paper towel waste a year. When it comes to math, you can see why we prefer the advanced course. Excel Dryer recently forged a partnership with Boston Latin School (BLS), America’s oldest public educational institution—yet a notably forward-thinking one. Following a curriculum we developed in collaboration with the Center for Green Schools, sustainability consulting firm Ecoimpact and BLS, members of its student-founded Youth Climate Action Network (YouthCAN) are closely examining the high-efficiency hand dryer’s role in greening and cost-saving initiatives for schools. In addition to real-world sustainability lessons, the innovative project offers a new kind of hands-on experience in field research, energy auditing, project management and more. With the success of the Boston Latin partnership, Excel Dryer is inviting schools across the nation to feel the power, too: The first 50 schools to complete our new course curriculum will receive 2 free* EPD Certified XLERATOR Hand Dryers in the 2018–9 school year. Learn more and download the curriculum. Give them a school of any size or layout, and germs seem to find their way around it. Determined to create a cleaner and greener environment for its nearly 40,000 students, the University Student Union at California State University, Northridge, equipped the restrooms of its multiple buildings with a variety of hands-free, eco-friendly fixtures. Among them? You guessed it. “I was very impressed with these units,” Gary Homesley, assistant director of facilities and maintenance for the student union, said of XLERATOR Hand Dryers. “They are the best dryers I’ve ever seen, and one of the most energy-efficient units on the market. I decided to get rid of all of our paper towels altogether.” Homesley cited XLERATOR’s ability to dry hands three times faster than conventional units as another important factor in the decision. Though proudly Made In USA Certified®, our products ultimately find homes—including educational institutions—all around the world. A global search for the perfect sustainable hand-drying solution led the Uşak Kanyon College school system in western Turkey to XLERATOR, which met the stringent specifications of the republic’s National Energy Efficiency Plan and provided significant cost savings. As part of a campus-wide greening initiative, the University of Reading installed XLERATOReco® Hand Dryers after an independent study revealed 55% less energy use than UK-produced blade-style dryers. That’s a cost savings of £1,452 (or $2,155 for those of us on this side of the pond). Finally, we’d like to give an honorary mention to American History. We can’t say we don’t enjoy the subject; after all, we’ve been building the finest American made hand dryers for the last 50 years. But as we continue to revolutionize the industry with innovative, sustainable technology, one thing’s for certain: we’re never going back to our old school. *Offer limited to U.S. schools currently using paper towels. Excel Dryer is not responsible for installation costs associated with these donated products. Previous story Let XLERATOR Be Your Playmaker!